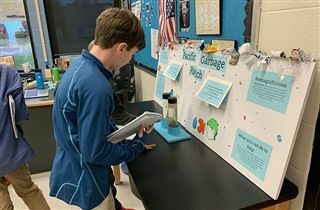 On November 9, Jackie Glass’s eighth grade science students’ “Save the Oceans” exhibits were on display for their peers to view. The students researched pollution levels in the ocean as well as possible solutions to those problems. The students then created displays showcasing their findings. Fourth and fifth grade science classes stopped by to learn about what their older peers learned through this project.